Cookbook review day here again!! 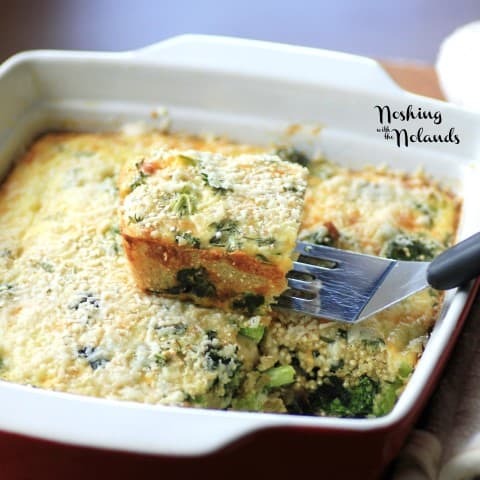 I love cookbooks and this one is packed full of healthy recipes like this Quinoa Quiche which is actually called Comforting Cheddar and Broccoli Quiche with Quinoa Crust but I thought that title was a little long!! 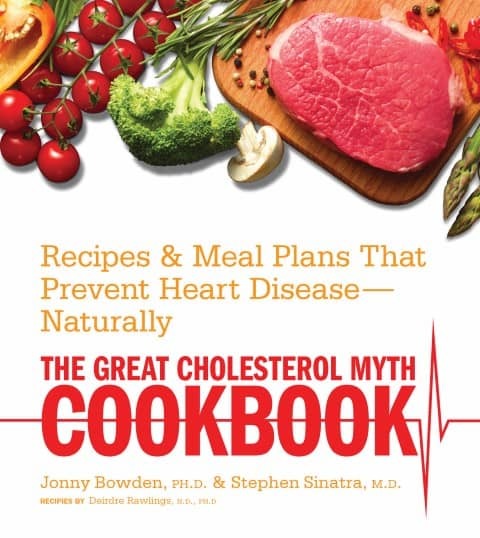 The cookbook we are reviewing today is The Great Cholesterol Myth Cookbook by Dr. Jonny Bowden, Ph.D., and Dr. Stephen T. Sinatra, M.D., and recipes by Deirdre Rawlings, N.D., Ph.D. The book debunks the idea that fat is not the enemy like we have been lead to believe but could be in fact part of the solution. Intrigued, let’s read on!! Bowden and Sinatra team with nutritionist Deirdre Rawlings to give you a detailed meal plan and help for optimal heart health!! This includes, 100 delicious and nutritious recipes, that will reverse heart disease or prevent it. Information on inflammation and HDL cholesterol. Tips to be making sure your diet provides the nutrition that you need. New ways to introduce back the food you love that you thought were gone forever!!! Many diets that are low in fat are high in grains and carbohydrates, this can lead to exacerbating heart health issues. The book shows that a diet low in sugar and other inflammatory foods and ingredients and high in healthy fats, protein, antioxidants and nutrients is the best course to prevent or reverse heart disease. The recipe we selected to try was this gorgeous quiche and man was it delicious!! We all loved it!! The recipe makes a huge quiche but was easily cut in half to feed our small family of three. This recipe is plum full of optimal nutrition and better yet packed with amazing taste!!! Quinoa is high in protein, folate, magnesium and tryptophan. Swiss chard contains more than 800 % of your daily need for Vit K. Broccoli has high amounts of vitamins A, C, folic acid, fiber and calcium. I can’t wait to make this recipe again!! Dr. Deirdre Rawlings hold a Ph.D. in holistic nutrition, a master’s degree in herbal medicine and is naturopathic doctor. She has also authored two previous books. 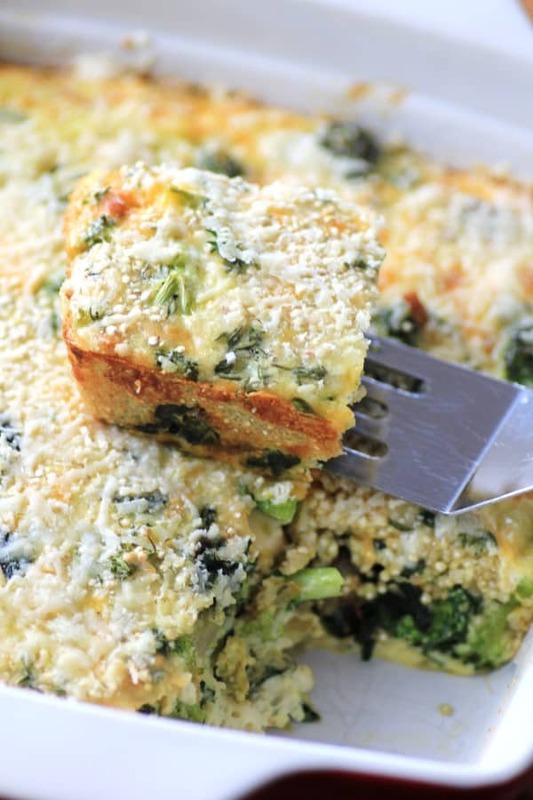 A deliciously nutritious quinoa quiche filled with swiss chard, broccoli and cheeses. Preheat the oven to 350°F (180°C, gas mark 4). Rinse the quinoa well and set aside to drain. Heat the oil in a pan over medium heat. Add the onion and garlic and sauté until the onion begins to brown, about 8 minutes. Add the Swiss chard and broccoli and sauté for 1 minute, then turn off the heat. Cool slightly. Transfer the mixture to a lightly greased 9- by 13-inch (23- by 33-cm) casserole dish and spread evenly. Sprinkle the Cheddar cheese evenly over the top of the vegetable mixture. Set aside. In a large bowl, combine the eggs, milk, thyme, salt, pepper, and rinsed quinoa and whisk until thoroughly combined. Pour immediately over the cheese-topped vegetable mixture. Bake the casserole in the oven until cooked through and the top is just starting to brown, about 40 minutes. Remove the casserole from the oven and sprinkle the Parmesan over the top. Return to the oven and bake until the Parmesan is melted and just starting to brown, about 5 more minutes. Let the casserole sit for at least 10 minutes before serving. Serve with a mixed lettuce or spinach salad. You can use kale instead of Swiss chard if you wish. Swiss chard eaten raw makes a nice base for smoothies, too, as it tends to be sweeter than kale. Per serving: 360 calories; 19.6 g fat; 20.8 g protein; 22.5 g carbs; 3.9 g fiber; 480.3 mg sodium. 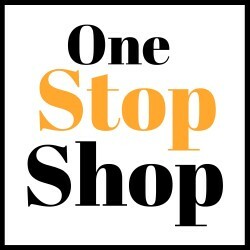 There are lots of other recipes to try like, Love-Your-Heart Red Lentil Soup, Tantalizing Thai Fish Cakes, Soul-Warming Tuna Lasagna, and Punch Peanut-Coconut Sauce to name a few!! Love this recipe. I can’t wait to try it! It was so good, I hope you love it!! Tara this looks and sounds delicious. Photos are stunning! love the idea of a quinoa quiche.. looks delicious! 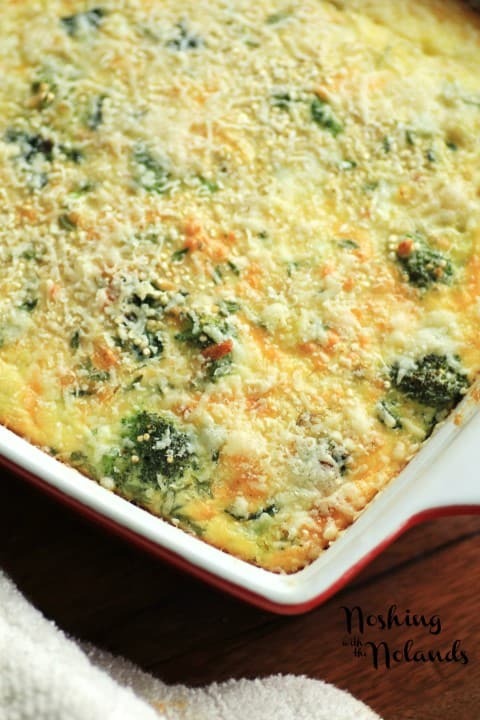 Your quinoa quiche looks fantastic! Neve thought about adding quinoa to a quiche. Real men do eat quiche and quinoa, my hubby loved it! Thanks Carrie!! Can I substitute skim milk for whole milk? I don’t want to ruin it. Sounds delicious! It might turn out a bit runny, do you have 2%? You can in some recipes substitute it, like a soup easily others turn out watery.